This is the Spring 2009 issue of Ireland's anarchist magazine Red Black Revolution, issue 15. You can read the articles online or download the PDF file. 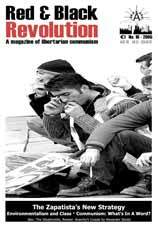 Links to all the issues of Red and Black Revolution from No1 published in 1994 onwards. Includes links to PDF files of each issue.